BWBS helped host a work party at one of South Lake Union's last green spaces. Burners Without Borders Seattle, partnered with Alleycat Acres, and Permaculture Action Network at the Cascade People’s Center & Giving Garden for a day of action and improvements. 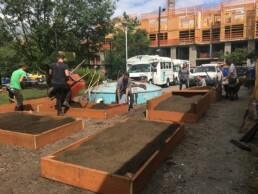 This park and garden is one of the last green spaces in South Lake Union and BWBS volunteers helped to remove weeds, rebuild raised beds, build compost spaces, and generally clean up the space. We had two DJs setting the tone for the event, and we brought enough food to feed the volunteers and anyone in the park who was in need of a hot meal. We had about twenty people turn out for this day of work, and the garden was transformed in just under six hours. This park and garden supports the local community, the YMCA and the local community. Thanks to all the volunteers who came out. Your work was impressive!